Replacing missing teeth is a big deal. There is a lot that goes into the procedure itself and a lot that can go wrong if you do not take care of the missing tooth promptly. That is why here at Dailley Dental Care in Berkeley CA, we strive to provide a welcoming and comforting environment, to boost your confidence that you are doing the right thing. We do not want any of our patients feeling apprehensive about their procedure, and we want our patients as educated as possible on the subject, because there is so much going on and so many options. For more information on the subject, feel free to call us today or to set up an appointment where we can answer all of your questions. Dental implants are small, titanium structures that we can surgically install into your jaw bone to replace a missing tooth or teeth. While this sounds intimidating, it is a pretty simple procedure, and the most challenging part is waiting through the healing process to continue. When we install the implant device, it fuses with the bone around it, essentially making it a part of your jaw. This part, though, takes time. We have to wait until you are all healed up to put an appliance on top so that we can be sure that spot is strong enough to support it. One of the great things about dental implants is their versatility when working with multiple appliances (such as one or more crowns, an implant-secured denture, an implant-secured bridge, or other options). We can attach these appliances on top of the implant to restore your mouth to its full potential and former glory! The implants themselves act as the roots of your natural teeth. After the healing process is over, your implant will be even stronger than your natural tooth, and it will have the exact same function as your original tooth did. The implant looks and feels great in your mouth, but also serves a greater purpose, as it works to stimulate your jaw with every bit you take, as well. This prevents bone loss that may accompany dentures or removable bridges. Enable a patient to chew properly and experience proper digestion. Provide support for an implant supported denture, making them more secure and comfortable, or even eliminating the need to take the denture in and out of the mouth. Dental implants are a great option because they look and act just like real teeth. The implant is consistently stimulating your jaw bone to keep your mouth healthy and strong. The appliance on top is durable and can last many years if not a lifetime with proper care without having to change your diet like you would with dentures. This is a very stable choice, as it acts just like bone, so you don’t have to worry about them shifting or sliding over time. They are comfortable, and you will forget you even have one! You won’t be able to tell the difference after everything is said and done. To care for your implants, just be sure to take good care of them, brushing and flossing daily and keeping up with your check-ups. The process for getting an implant is relatively straightforward, though it does require detailed planning during a number of visits over several months. Preparation: When you come in for your appointment, we will start with dental x-rays and impressions (molds). These are taken of the jaw and teeth to determine if there is adequate bone, gum tissue, and spacing available for an implant. If a patient is deficient in any of theses areas, a preliminary procedure may be necessary to provide either adequate bone, gum tissue, or space to enable an implant to be placed. Sedation: When it’s time to install the implant, we will administer an anesthetic to make it a pain free experience. Once the area is anesthetized, the implant is surgically placed into the bone and allowed to heal and integrate itself onto the bone for approximately 3-4 months. Surgery: We will make an incision in the gums to expose the bone, where we will be able to insert the implant. Before continuing, we will let it heal for about four months, which gives it plenty of time to heal and fuse with the bone. When it is healed completely, we can secure your permanent denture, crown, or bridge, and you will be back to your comfortable self and a natural-looking beautiful smile. Restoration: After the implant has healed and integrated with the bone, the prosthetic phase of the treatment is completed which involves fabricating an abutment (a post-like device) that is attached to the underlying implant. The crown is then fabrication to fit the abutment and it is attached to the abutment. Recovery: Once our patients receive their implant they will receive detailed instructions on how to care for their implant(s) so that they will have many years of good service from the prosthesis. Good oral hygiene, eating habits, and regular dental visits are all important to the longevity of a new implant. When it comes to picking what artificial tooth system to secure to your implant, there is a lot to look at. If you are missing a single tooth, you will likely be given a single dental implant, which is topped with a crown that is made of porcelain fused with metal or a composite substance. If you get multiple crowns, you will need multiple implants. However, if you are missing multiple teeth in a row, a bridge is also an option. These are artificial teeth that are attached to each other and can cover more than one gap. This may require more than one implant to anchor it in place. Finally, if you find yourself missing more or all of your teeth, we can even provide you with fixed, permanent dentures to cover both your upper and lower tooth arches. These require four-to-six implants, but offer a stability and comfort that you cannot get with traditional dentures that sit on your gums. For various reasons, not everyone who wants an implant can get one. This decision can only be made by Anthony Dailley, DDS, who will measure the bone density, the remaining amount of bone, the patient’s oral hygiene, and more. To find out if you are a candidate, please set up a consultation with Anthony Dailley, DDS today. What if I’m not a Candidate for Dental Implants? Some patients experience a lack of bone density. This must be taken care of first with something called a bone graft. Long story short, in a bone grafting procedure, we will transplant bone from another part of your jaw, another part of your body, a cadaver bone (human or bovine), or a synthetic bone, and we will use that to reinforce what bone structure you have and to continue growing new bone. This could happen due to bone loss from too long without a tooth, dentures, or even just genetics. Once that transplant is healed and fused properly, we can begin the installation of the implant. If you do not need an implant, then you are set to go. What are the Components That Make up a Dental Implant? 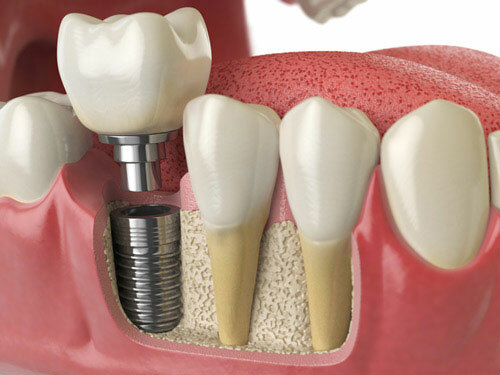 There are three components that make up a completed dental implant. 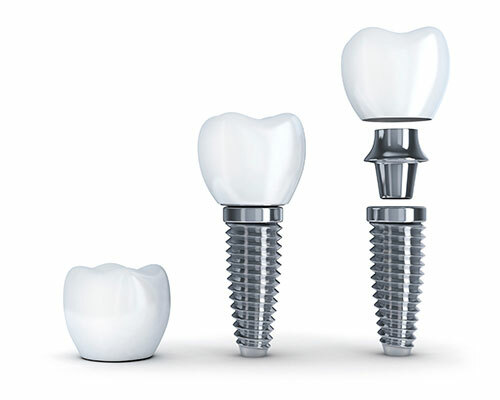 The dental implant body is made of surgical grade titanium metal. It is surgically placed in the bone and allowed to integrate (osseointegration) with the bone to eventually become fixed and solid in the bone like a natural tooth. The process of osseointegration usually takes 3-4 months. 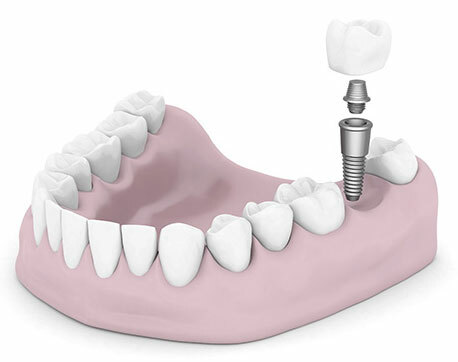 The implant abutment is usually fabricated from surgical grade titanium. After the implant has fully integrated with the bone an implant abutment is custom fabricated for that particular implant body and surrounding gum tissue. The abutment is then seated into the body of the implant and attached via an internal screw. Last but not least is the crown that will be secured to the implant abutment either by screwing it to the abutment or by cementing it in place the same way a regular crown is cemented to a natural tooth. Are Dental Implants Better than a Denture or Bridge? 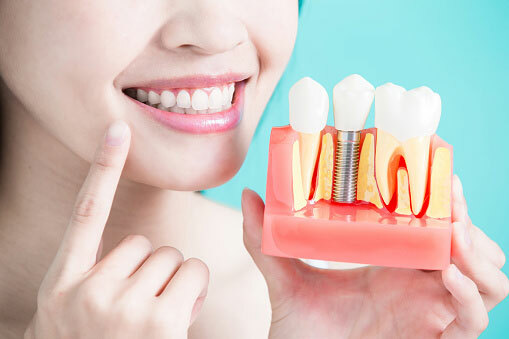 Dental implants are the best long term solution for replacing missing teeth and also provide an excellent alternative to having to wear removable partial or complete dentures. Implants can either replace removable dental prosthesis or provide provide excellent support and stability for these types of dental appliances. The most common use of dental implants if for the replacement of missing teeth. One of the big advantages of placing an implant in the mouth to replace a missing tooth over fabricating a fixed bridge to replace the tooth is a bridge involves preparing the anchor teeth on either side of the missing tooth, whereas an implant procedure does not involve the adjacent teeth at all. One of the areas of dentistry that we focus a lot of attention is in the area of implant dentistry. Anthony Dailley, DDS has been performing implant dentistry since 1990 and has taken extensive training in the Berkeley area, and holds a position as a fellow in the international Congress of Implantology. Dental implants are artificial roots (usually made of titanium) and teeth (usually made of porcelain) that are surgically placed into the upper or lower jaw bone. Although the process of providing implant treatment to a patient is rather complex and involves numerous step by the dentist, the actual surgery is actually far less traumatic that having a simple tooth removed. In fact, the majority of patients we surgically place implants for rarely have to use any pain medication following the procedure. One of the big reasons for this is that bone does not have any nerves in it, and the procedure itself is relatively atraumatic. The teeth attached to implants are very natural looking and often enhance or restore a patient’s smile! Dental implants are very strong, stable, and durable, and will last many years. Why Should I get Dental Implants at Dailley Dental Care? Anthony Dailley, DDS has been awarded a Fellowship in the International Congress of Oral Implantologists (ICOI). The ICOIis an international organization of doctors who specialize in dental implant surgery and implant prosthetics.The organization meets at various locations around the world each year to promote post doctoral education and research and to learn the latest advancements in dental implant procedures. In order to be awarded a fellowship, the examining committee of the ICOI examines the credentials of the applicant, their experience in implantology, and their level of expertise in implant surgery and prosthetic oral rehabilitation. In addition, actual implant treatment cases are submitted for the board’s review before the position of a Fellowship can be awarded to an applicant. What if I Still Have Questions About Dental Implants? Do you still have questions about dental implants, or are you ready to schedule your dental implant consultation at our Berkeley dental office? Give us a call at (510) 883-3454 today! Dailley Dental Care has years of experience in restoring the smiles of so many different people who have been through so many different things. Let us help you, too. We can assure you that you are safe and sound with us and that we can walk you through everything so that you are comfortable.